No Richard Thompson 'Torpedo' for this weekend's IAAF World Relays in the Bahamas, but Team TT is still expected to battle for precious metal at the much anticipate event in Nassau. In his absence Khalifa St. Fort and Michelle-lee Ahye alongside Keston Bledman will lead a 22-member T&T into battle. St. Fort and Ahye have been selected for the 4x100 metres and 4x200m and will be joined by fellow Olympians Kelly-Ann Baptiste, Reyare Thomas, Semoy Hackett and former World Relays bronze medallist, Kamaria Durant in the shorter race. In the 4x200M Anika Charles replaces Baptiste, and is also part of the T&T's 4x400m team which includes Olympians Kai Selvon, Janeil Bellille and Dominique Williams. Bledman is joined by Emmanuel Callender on the both the 4x100m and 4x200m teams alongside Moriba Morain, Danneil Telesford and Olympian Kyle Greaux, and in the longer event will add Renny Quow, Telesford and Jereem Richards. Sportsman of the Year Machel Cedenio leads a powerful mile relay outfit that includes Jarrin Solomon, Deon Lendore, Lalonde Gordon, Quow and Richards. The mixed 4x400M team contains Charles, Quow, Richards, Solomon and Williams. Our women 4x100m , 4x200m should medal along with our men 4x400m. Not so sure about our men 4x100m and 4x200m. I hope they can surprise me. T&T 4x100 men finished fifth in their heat and will not be in the final. Seeing how the men short sprint relay team has been performing over the years no surprise there. Yes. Low 44 for sure. Don't know about sub 44. The mix relays are going to be good. I expect Jamaica, USA and Great Britain to be the ones to beat. Miller and Gardner running on the same team will be a good one to watch. Definitely low 44, he looks to be really strong and barring injury or mishap should get an individual spot on the world champs team. I pray he remains healthy. We have so much depth in the men's 4x4 it's astounding. We didn't even use Machel and still did well. Our 4x100m men's is now lacking and our women's 4x400m team is too. If we can build those teams up we can have 4 solid relay teams. Our 4x100m men's team needs practice, practice, practice. We no longer have optimum leg speed (i.e. Torpedo, Burns at their prime). So we need to try a Japan. 4x100m men won the B final. So props to them! Well it pays to get the stick around. We now automatically qualify for the WC in London later this year due to all the mishaps in the "A" final. Now to find a way to shave a second of that time so we can have a respectable showing by the time we get to London. The womens 4x200 could have run a national record if the last hand off was better methinks. US wins the final. Big surprise to see who finished second and Canada no where to be found. I am happy that they sent the women 4x4. Yes, they did not qualify, but we need to do everything to encourage our beautiful ladies to gravitate to the mid distant sprint events. That is why Carifta is so important. I wonder if the girl who won the girls Heptaphlon could have been on that team. But then she had to go back to school. Hang in there Ladies. God Bless. Congrats to Barbados on their silvermedal win. 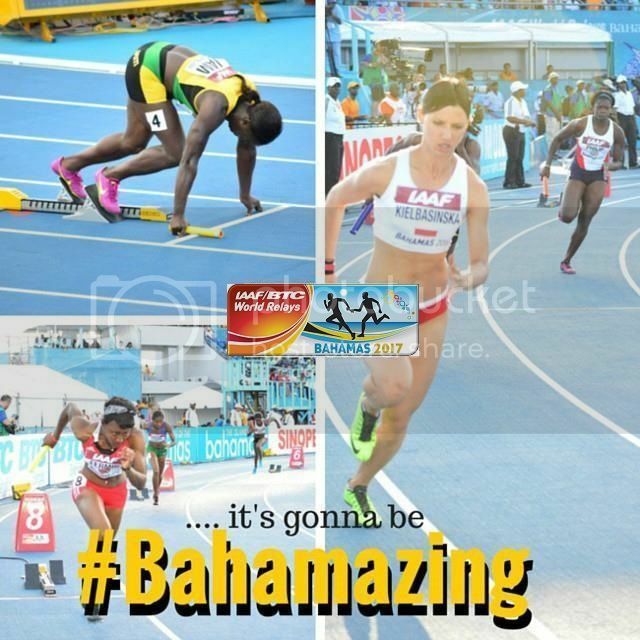 Go to 4:21:50 in video of "IAAF/BTC World Relays Bahamas 2017 - Day 1" coverage below for Women's 4x200m final featuring Team TTO. Yup practice is needed but I was impressed with the run in the final. The hand offs were smooth and Mr Callender did the back stretch justice. Looked really smooth. Really like how D Telesford came back from 3rd to pull through what we need now is practice, practice, practice. I believe then we can drop a second off. One positive I can see is that they now know what is required of them to be world class. I have nothing but love for my country women and men that go out there and give their all. I just long for the day when we can have 4 solid relay teams at a world champs/oly games. We are getting there gradually. I think 2004 was the first time our ladies 4x1 were represented since 1984 I believe. Ever since they have gotten stronger. Our 4x4 men remain the standard. Our 4x1 men still have the experience of Emmanuel Callender and Richard Thompson. Our 4x4 women just need to drop their times. We can't have 2 52.x runners and the rest 53.x and expect to compete with the likes of the US, Jamaica, GB etc. It won't be an overnight thing but I believe they have the talent and potential to be the best. 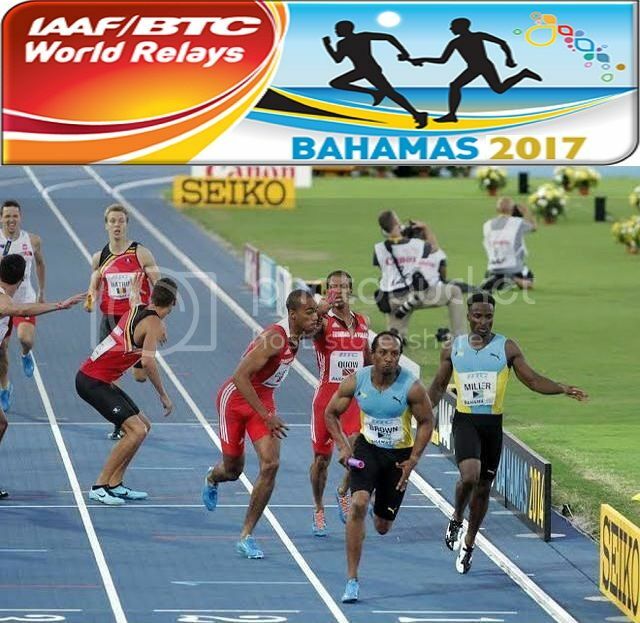 An IAAF/BTC World Relays record in the women's 4x200m and yet another dramatic finish in the men's 4x100m were among the key highlights on the first day of the IAAF/BTC World Relays Bahamas 2017, with plenty more drama on tap when competition resumes this evening. 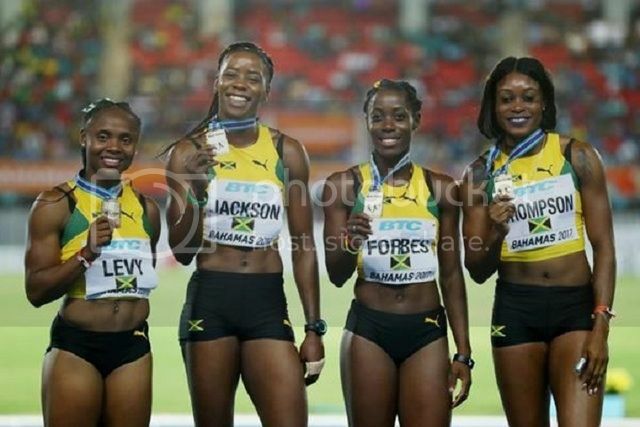 Jura Levy, Olympic 400m bronze medallist Shericka Jackson, Sashalee Forbes and double Olympic champion Elaine Thompson dominated gun-to-tape en route to their 1:29.04 performance to knock 0.41 from the competition record set by the USA two years ago. This time around and well after Thompson crossed the line fist raised to the sky, the USA squad could do no better than third, after Gina Lukenkemper out-dueled Shalonda Solomon down the homestretch to give Germany surprise silver. The USA, out to defend their back-to-back Golden Baton honours, fared better in the men's 4x100m and women's 4x800m, collecting convincing victories to retain those respective titles and carry an 11-point lead into day two. In the evening-capping men's 4x100m, showdowns between the USA, Jamaica and Canada never quite materialised: Canada missed their exchange between runners two and three while Jamaica suffered a similar fate and couldn't even manage to advance from the opening round heat. The last remaining challenge to the USA, an in-form British squad, also fell by the wayside when they botched the final exchange. That left Justin Gatlin alone at the front en route to their 38.43 win. Barbados was a distance second in 39.18 with China third. The evening's first final was deja vu all over again at Thomas A Robinson Stadium, with the USA winning their third straight title in the women's 4x800m. Chanelle Price, Chrishuna Williams, Laura Roesler and Charlene Lipsey won by nearly four seconds over Belarus in 8:16.36 with Australia taking third. Competition kicks off at 19:35 local time (GMT+4) with the heats of the men's 4x200m before the inaugural mixed 4x400m brings down the curtain at 22:30. 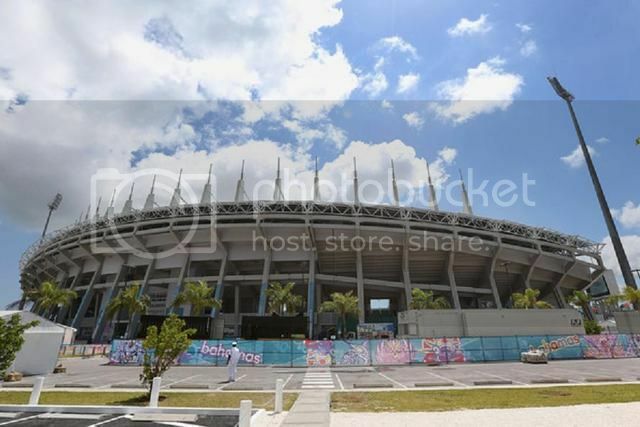 In the latter, the focus will fall firmly on the hosts, with Bahamian golden girl Shaunae Miller-Uibo, the Olympic 400m champion, and Steven Gardiner, the current world leader in the event, expected to compete. Although neither team advanced to Sunday's final, both ran impressively in Saturday's 4x400m heats, with Miller-Uibo's 50.20 split the fastest of the round. The men's 4x400m is shaping into a showdown between the USA, Trinidad & Tobago and Jamaica. Botswana looked strong as well in the heats, propelled by Karabo Sibanda whose 44.82 was the fastest split of the opening round. It'll likely be a similar scenario on the women's side with the focus on USA, Jamaica and an inspired Polish team. The men's 4x800m, meanwhile, will present Kenya's best chance to bounce back from a sub-par opening day, entering the race as podium favourites alongside defending champions USA and Poland. Alongside them, the Athlete Refugee Team will be making their eagerly awaited IAAF World Athletics Series debut. Action also gets underway in the women's 4x100m, where yet another USA-Jamaica showdown is expected. How many times has the women f up the first exchange? I wonder what our Women 4x100m Relay team needs to do to qualify for the World Champs in London now? Ato must be seriously disappointed with the team!